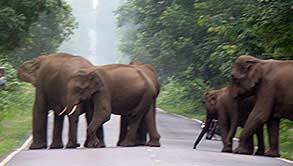 Gorumara National Park is located in the Dooars region of Jalpaiguri district. 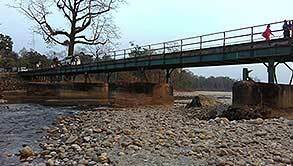 River Murti, Jaldhaka and Ingdong have passed through this national park. 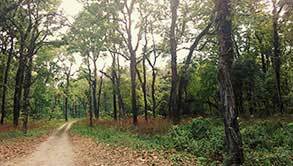 In the year 1949, Gorumara forest was declared as wildlife sanctuary when it was a small forest. Later in the year 1992, it was declared as the National park, comprising of 79.45 square kilometers area.Lataguri is the nearest small tourist strip near Gorumara National Park. Private resorts, accommodations are available here. 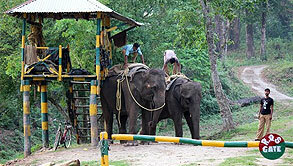 Tourists may visit Gorumara in day time staying at Lataguri. 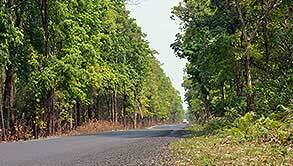 Tropical most Deciduas Sal Forest associated with Odal, Lali, Katus, Dilenia, Simul, Siris, Khair, Terai grasslands etc. Great Indian Rhinoceros, Leopard, Elephant, Sloth Bear, Hog Deer, Pigmy Hog, Sanbhar, Python, Turtle, Migratory Birds, Peafowl, Indian Pied Horn Bill etc. By Rail – Railway link is satisfactory but the frequency is less i.e. 3 – 4 trains a day. The railway station is bit away from the township. Trains from Siliguri are available at Malbazar station and is 2 hours from Siliguri. By Road – The national Highway number 31 – A is connected with Malbazar bus and railway terminus. Regular bus service is available to and from Siliguri, Jalpaiguri, Jaigaon (Indo-Bhutan Border Town) etc.